Over the last few months the island of Boracay has gone through several improvements and changes. Among those changes is the requirement that all visitors to the island must provide the names and exact number of guests staying at their reserved accommodation. Isla Gecko is a renovated budget boutique hotel located in the heart of Boracay’s famous White Beach. Located just a few minute walk away from the beach, shopping, restaurants and exciting nightlife, Isla Gecko gives you a front row seat to all the wonders that Boracay has to offer! At Isla Gecko, you’ll be in the center of it all and still tucked away from the busy hotspots just enough to kick up your feet and relax! 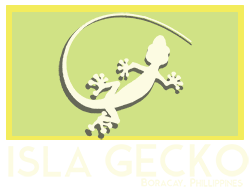 When it comes to enjoying local activities and attractions, Isla Gecko is in the center of it all! We are located conveniently in Station 2 of Boracay’s famous White Beach where you’ll have immediate access to scuba diving excursions, snorkeling tours, sailing, helmut diving, kayaking and even parasailing! Not to mention all the fun you’ll have on land with dozens of restaurants, an outside mall full of diverse shops as well as live music and performances to enjoy at night. If you like more extreme water sports, Isla Gecko is just a short tricycle ride away from Bulabog Beach! There, they offer kite boarding and windsurfing! From June to August, extreme water sporting moves to White Beach where you’ll be even closer with just a minute walk away! Here at Isla Gecko we recieve guests from all over the world. Our versatile rooms are suited for all travelers, from families to couples to groups. It is of utmost importance to us that our guests are able to maximize their experience on Boracay with the convenience of Isla Gecko's location, and that every guest recieve the same comforts as they would at home. We strive to make memories that will stay with our guests forever, all within wallet friendly prices! Enjoy your breakfast with a cup of French Press coffee, or delight in a fresh pot of lemongrass tea. Relax at Bar Luna with a San Miguel beer or one of our redefined Classic Cocktails like our Hickory Smoked Old Fashioned or our Moscow Mule. After a long day at the beach, you can catch up on email with our complimentary wifi, pick from a collection of books and magazines to read in our 2nd floor lounge, and bask underneath the stars on our garden terrace. Our friendly staff is ready on hand for linen, towel and cleaning services and happy to assist you in locating attractions, joining tours and exploring other parts of the island.